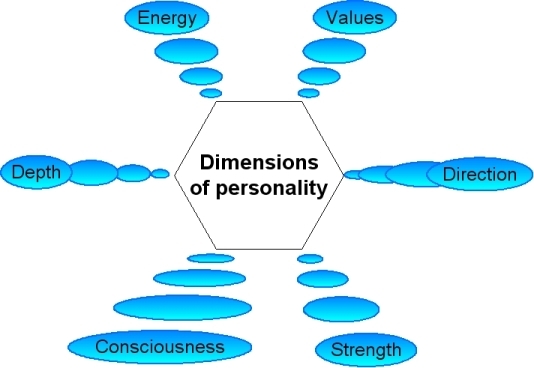 This article presents an overview of human personality in terms of six basic dimensions. Separate articles will also be found on this site exploring each of these dimensions in greater detail. The composition of human personality is the subject of innumerable theories. Each focuses on one or several particular aspects or dimensions of personality, but none appear to consider it in its full scope, depth and integrity. Some theories focus more on differences in type, others on the relative development of specific characteristics and competencies and still others on the dynamics of interaction between several psychological constructs such as Freud's ego, super ego and id. A typological approach to categorize personalities fails to take into account wide variations in intensity that would adequately distinguish a Napoleon from a dominant local leader. Behavioral descriptions do not adequately distinguish between external expressions of personality and inner motivation. In an effort towards scientific objectivity and impartiality, most theories omit assigning values to differences in personal orientation to other people and the world around, yet the distinction between a good, kind, generous person who relates positively to everyone and one who is jealous, mean or evil-motive cannot be merely dismissed as a difference in type. A comprehensive theory of personality would need to account for and integrate all these dimensions -- typal differences, varying levels of development and dynamics. A first step in evolution of such a theory would be to clearly identify the structural dimensions on which personalities differ. This is a subjective measure of the strength or intensity of personality which is very tangible to observation and experience but extremely difficult to define and measure. Great personalities in politics, business and even in the arts are almost invariably described as 'high energy' people. Personality theory needs to identify the source and determinants of that energy. It needs to distinguish between qualitative differences in the type of energy observed, such as the difference between a Napoleon and Mahatma Gandhi. It needs also to account for varying intensities of energy at the mental, vital and physical levels of the being which is discussed below. This refers to whether the person's attitudes, motives, intentions and actions are positively or negatively related to the welfare and well-being of other individuals and society. In common parlance, whether the person is 'good' or 'bad'. Sherlock Holmes and Dr. Moriarty are both depicted as well-formed high energy, mental characters, yet they dedicate their lives and direct their energies in diametrically opposite directions. Goodwill is an expression of positive direction. This refers quite literally to what is most important or valuable to a person. If direction is a horizontal measure of good vs. bad, values are a vertical measure of higher vs. lower. Selflessness is high, selfishness as a central motivating force is low. This vertical dimension expresses at all three levels of consciousness. Thus, idealism, honesty, integrity, self-respect, self-reliance and self-giving are high mental values. Loyalty, courage and generosity are high vital values. Cleanliness, punctuality and efficiency are high physical values. For a fuller discussion and illustration of personal values, see Values and Personal values. Depth refers to the degree to which these deeper layers are formed in the person. Manners -- Superficial, external forms of formalized response, a subset of social or interpersonal skills. Behavior -- The capacity of a person for directed activities based on conscious understanding and intensity. Character -- The fixed attributes reflecting values that have become fully organized, internalized, fixed and subconscious. Personality -- The capacity for expansive or creative initiative that transcend the limitations imposed by character, society or personal experience. Individuality -- A center of uniqueness, quite independent of social conditioning, personal experience and character. We have referred elsewhere to several stages in the formation of personality under the terms Manners-Behavior-Character-Personality-Individuality. There are people such as Lydia Bennet and Mrs. Bennet in Pride & Prejudice who have not yet developed the self-control and maturity needed even for reasonably good manners and are very unlikely to do so, regardless of their upbringing. Their very nerves are not yet capable of that discipline. Others acquire perfect external manners, such as the teachers and students in Mona Lisa Smile, but how they behave outwardly does not really reflect how they think and feel inside. Still others, such as Jane Bennet in Pride & Prejudice, have achieved a level in which their inner feelings are fully in accordance with their external manners. They truly mean and feel what they say, but the form of their personalities is largely determined by the social norms and standards of the society in which they were raised. Still others have a formed character that is capable of higher accomplishment, such as Darcy in Pride & Prejudice. Then there are a few at the level of personality and true individuality who have developed to the point where they can transcend the limitations imposed by society and their own upbringing. Mikhail Gorbachev exhibited real personality in undermining the monopoly on power of the political party and government which he headed. This refers to the relative development and predominance of the physical, vital and mental parts or levels of consciousness. Physical -- Consciousness related to the body, physical needs and material things, which is fixed, inflexible and gives credence only to the here and now. Vital -- Consciousness related to the nervous and emotional, the centers of energy, sensations, feelings, desires and urges. Mental -- Consciousness related to the ideas and ideals, the capacity for thinking, analysis, understanding, organization and planned initiative. This factor is difficult to describe or measure, but differences in the size and intensity of personality can be readily perceived in some instances, especially when one is in the presence of a towering personality such as a Napoleon, a Goethe, a Churchill or a Gandhi. Every individual have their own characteristic level of intensity which is distinct from the vital or mental energy that they express and may best be represented by their overall capacity to change or influence the people with whom they relate and the environment within which they live. These six dimensions combine and interact with one another in complex ways to form the web and woof of human personality. It may be helpful to think of human personality as a point or small three dimension object in space. Our trajectory for growth is to expand from that point in multiple dimensions to become a sphere. The point is present level of personality formation with limited knowledge, capacity, power and enjoyment. The sphere is our greater, true being which is potentially as vast as the whole universe and infinite in knowledge, capacity, power and joy. Our progress from a point to a sphere is a progress along the dimensions described briefly in this article and explored in greater detail in the Personality Portal and Spirituality Portal.